The Manchester Velodrome, a banked Siberian Pine-surfaced track, which has hosted the UCI World Championships on three occasions and home to British Cycling. Track cycling has been around since at least 1870. When cycling was in its infancy, wooden indoor tracks were laid which resemble those of modern velodromes, consisting of two straights and slightly banked turns. One appeal of indoor track racing was that spectators could be easily controlled, and hence an entrance fee could be charged, making track racing a lucrative sport. Early track races attracted crowds of up to 2000 people. Indoor tracks also enabled year-round cycling for the first time. The main early centers for track racing in Britain were Birmingham, Sheffield, Liverpool, Manchester and London. The most noticeable changes in over a century of track cycling have concerned the bikes themselves, engineered to be lighter and more aerodynamic to enable ever-faster times. With the exception of the 1912 Olympics, track cycling has been featured in every modern Olympic Games. Women's track cycling was first included in the modern Olympics in 1988. Aerodynamic drag is a significant factor in both road and track racing. Frames are often constructed of moulded carbon fiber, for a lightweight design, although more traditionally frames are constructed from steel, aluminium, or other metal alloys. More recently, track (and road) bikes have employed airfoil designs on the tubes of the frame to reduce aerodynamic drag. On a dedicated track bicycle there are few components, with no need for brakes or derailleurs (and therefore shifters). In fact the only moving part on a bicycle is the drivetrain, which includes the cranks, pedals, the single chainring, one cog fixed to the hub without a freewheel mechanism and the chain itself. Because of this the need for aerodynamic components is minimised, and the aerodynamic to weight ratio makes aerodynamic componentry, at present, an idea with more cons than pros. Even in road cycling today, components (excepting brakes and sometimes shifters) are not usually made aerodynamic, even in time trial and 'aero' road bikes. Given the importance of aerodynamics, the riders' sitting position becomes extremely important. The riding position is similar to the road racing position, but is ultimately dependent on the frame geometry of the bicycle and the handlebars used. Handlebars on track bikes used for longer events such as the points race are similar to the drop bars found on road bicycles. However, in the sprint event the rider's position is more extreme compared with a road rider. The bars are lower and the saddle is higher and more forward. Bars are often narrower with a deeper drop. Steel bars, as opposed to lighter alloys or carbon fibre, are still used by many sprinters for their higher rigidity and durability. In timed events such as the pursuit and the time trial, riders often use aerobars or 'triathlon bars' similar to those found on road time trial bicycles, allowing the rider to position the arms closer together in front of the body. This results in a more horizontal back and presents the minimum frontal area to reduce drag. Aerobars can be separate bars that are attached to time trial or bull horn bars, or they can be part of a one-piece monocoque design. Use of aerobars is permitted only in pursuit and time trial events. Formats of track cycle races are also heavily influenced by aerodynamics. If one rider closely follows, they draft or slipstream another, because the leading rider pushes air around themselves; any rider closely following has to push out less air than the lead rider and thus can travel at the same speed while expending less effort. This fact has led to a variety of racing styles that allow skilled riders or teams to exploit this tactical advantage, as well as formats that simply test strength, speed and endurance. During the early 1990s in individual pursuit events, some riders, most notably Graeme Obree, adopted a straight-armed Superman-like position with their arms fully extended horizontally, but this position was subsequently outlawed by the Union Cycliste Internationale (UCI), the sport's ruling body. Recumbent bicycles can actually be ridden faster due to their aerodynamic advantage, but are similarly banned from UCI competition. Track cycling is particularly popular in Europe, notably Belgium, France, Germany and the United Kingdom where it is often used as off-season training by road racers (professional six-day 'Madison' events were often entered by two-man teams comprising a leading road racer and a track specialist). The sport also has significant followings in Japan and Australia. In the United States, track racing reached a peak of popularity in the 1930s when six-day races were held in Madison Square Garden in New York. The word "Madison" is still used as the name for this type of race in six-day racing. A group of US velodromes formed the American Track Racing Association (ATRA) and its membership now includes more than half of all velodromes in the US. Track cycling events fit into two broad categories: sprint races and endurance races. Riders will typically fall into one category and not compete in the other. Riders with good all round ability in the junior ranks will decide to focus on one area or another before moving up to the senior ranks. Miss and Out, elimination or "Devil Take the Hindmost"
Held every four years as part of the Summer Olympics. There are currently 10 events in the Olympics, fewer than appear in the World Championships. At the 2008 Summer Olympics, seven of these events were for men while only three were for women. For the 2012 Summer Olympics, there were five events for both men and women. For the 2016 Summer Olympics the events remained the same. The UCI Track Cycling World Championships are held every year, usually in March or April at the end of the winter track season. There are currently 19 events in the World Championships, 10 for men and 9 for women. Qualification places are determined by different countries performance during the World Cup Classic series held through the season. The UCI Track Cycling World Cup series consists of four or five meetings, held in different countries throughout the world during the winter track cycling season. These meeting include 17 of the 19 events (excluding the omnium for men and women) that take place in a World Championship over three days. Events won and points scored by the riders throughout this series count towards qualification places individually and for their nation in the World Championships at the end of the season. The overall leader in each event wears the white points leaders jersey at each race, with the overall winner at the end of the season keeping the jersey and wearing it at the World Championships. Riders compete for either national teams or trade teams. As World Championship qualification is at stake, the events attract a top field of riders. However, it is common for top riders not to compete at all the events of the series, with teams often using the events to field younger riders or attempt different line-ups at some events. Top riders can still win the series, or obtain good a placing for qualification points for their country, without competing at every event. The UCI Track Cycling World Ranking is based upon the results in all women's UCI-sanctioned races over a twelve-month period. The ranking includes an individual and a nations ranking and includes the disciplines: individual pursuit, points race, scratch, sprint, time trial, keirin, omnium (since 2010-11), team pursuit, team sprint and madison (men only). Several countries run a series of national level events held as part of series throughout each of those countries and sometimes across country borders. Examples of these are the Revolution track series held in both the UK and Australia, and the ATRA NCS series in the United States. In addition to regular track racing, tracks are also the venue for many cycling records. These are over either a fixed distance or for a fixed period of time. The most famous of these is the hour record, which involves simply riding as far as possible in one hour. The history of the hour record is replete with exploits by some of the greatest names in cycling from both road and track racing (including, among others, Major Taylor, Henri Desgrange, Fausto Coppi, Jacques Anquetil, Eddy Merckx, Francesco Moser, Miguel Indurain and Tony Rominger). 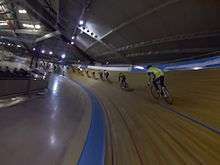 Originally, attempts were made at velodromes with reputations for being fast (such as the Velodromo Vigorelli in Milan). More recently, attempts have moved to high-altitude locations, such as Mexico City, where the thinner air results in lower aerodynamic drag, which more than offsets the added difficulty of breathing. Innovations in equipment and the rider's position on the bike have also led to dramatic improvements in the hour record, but have also been a source of controversy (see Graeme Obree). 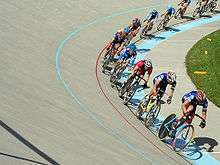 Wikimedia Commons has media related to Track cycling.